We all know just how much fun it can be to bring our pups out on a walk. Not to mention that going out and about, taking in the sights and sounds provides pups with the great enrichment that they need! Plus, when you have pups that are cooped up in the house all day, it is no wonder that they would desperately need to burn off all that excess energy, lest they get up to mischief! This German Shepherd and his Labrador Retriever friend are out for a morning stroll with their Dad and human sibling in a nearby field! 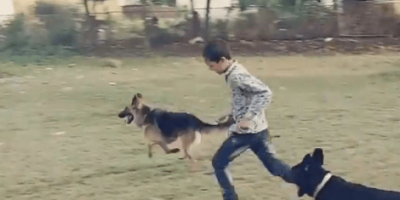 Of course, instead of walking around on a leash, this Dad decided to try getting two birds with one stone – he got the pups to chase his boy all around the field instead! As you can see, everyone is having an absolute blast! Not to mention that everyone involved is also getting the exercise they need too! This Adorable Pup’s First Week At Home Is Going To Bring A Smile To Your Face!